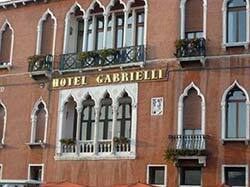 The four-star Hotel Gabrielli Sandwirth is just beyond the crush of luxury hotels on the Riva degli Schiavoni. Its 14th Century Venetian Gothic palazzo faces the St. Mark's Basin waterfront, about 10 minutes on foot from the Piazza San Marco. As you leave the waterbus pier, turn left and walk to the stone bridge. The Gabrielli Sandwirth will be on your right, facing the water. Get off at the Zaccaria stop, turn right, cross the stone bridge, and continue walking along the waterfront until you reach the Gabrielli Sandwirth.